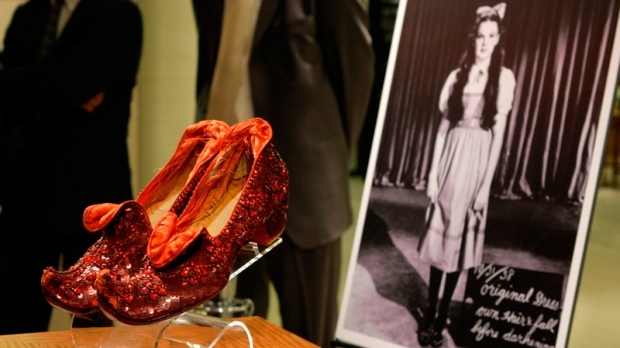 IN his continuing search for the more weird and wondrous in the world of travel, David Ellis says a mystery fan of Judy Garland and 1939's classic Wizard of Oz, has offered a US$1m reward (AU$1,341,500) for the return of the 5B sequined red slippers the star wore in the movie, and which were stolen from the Judy Garland Museum in Grand Rapids, Minnesota ten years ago next month. The slippers were one of at least four pairs known to have been made in slightly different sizes to allow for the star's feet to swell during daily rehearsals and filming of the movie, and all of which had lain "lost" from 1939 until 1970 when MGM Studios workers found them while preparing for an auction of decade's old movie costumes and props. And while "ruby slippers" in the movie, they were not covered with rubies but with hand-sewn sparkling rhinestones and sequins for Judy Garland to wear when Glinda, the Good Witch, tells Dorothy that to get home she must "close your eyes and tap your heels together three times, and think to yourself there's no place like home…"
The slippers for which the US$1m reward has just been offered by the anonymous obviously very devoted Judy Garland fan, were insured for US$1m but the Judy Garland Museum from which they were stolen ten years ago next month, say they could be worth up to three times that (just over AUS$4m) now.